Pie Five Pizza Co. is celebrating National Pizza Month with the superstar of its Pizza Masters competition -- Debuts Limited-Time Spinach Alfredo Pizza. DALLAS, Oct. 4, 2018 /PRNewswire/ -- Pie Five Pizza Co. is celebrating National Pizza Month with the superstar of its Pizza Masters competition. Earlier this year, Pie Five's pizza perfectionists handcrafted five specialty pizzas for fans to vote on. The Spinach Alfredo Pizza, crafted by the Pie Five team in Clearwater, Fla., was the fan favorite, winning the brand-wide Pizza Masters competition. 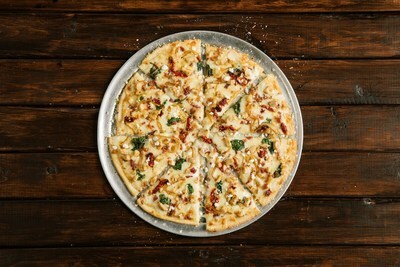 The Spinach Alfredo Pizza is crafted using alfredo sauce with mozzarella, parmesan cheese, spinach, bacon, grilled chicken, caramelized onions and sundried tomatoes, finished with Magic Dust and feta cheese. Not a fan of bacon? Want to add more veggies? Guests still have the freedom to customize this freshly prepared pizza any way they'd like. "Our team members love to create their own special recipes so we wanted to encourage that and reward them for their creativity. The Pizza Maters competition gave them that outlet and this recipe was the popular favorite when we asked our loyal customers to choose the winner. Also, since October is National Pizza Month, we felt it was the perfect time to add the winner to our lineup of specialty pizzas," said Vice President of Marketing Christina Coy. "The Pie Five team in Clearwater knocked this one out of the park. We are excited to make this flavor-packed pizza available for the fans that voted for it." "We had a lot of fun working together as a team to create the Spinach Alfredo Pizza," said General Manager Franz Gilis. "When we heard that fans had voted for the pizza we created, we were ecstatic. It's a huge honor to have the Spinach Alfredo Pizza featured at Pie Five." Available as a personal pie or large pizza size, the Spinach Alfredo Pizza pairs perfectly with an ice cold Dr Pepper. This specialty pizza is only available through Nov. 18, so come in and indulge in the winner before it's too late! Pie Five's fast-casual concept provides guests with a fully customizable experience from start to finish. With more than 30 fresh toppings, six savory sauces and five crust choices, there's a delicious pairing to match every guest's preference. Pie Five also accommodates dietary restrictions by offering low-carb cauliflower crust, gluten-free crust and vegan cheese options. In addition to customizable large and kids pizzas, Pie Five also serves toasted sandwiches, freshly tossed salad and warm cinnamon stix dessert – perfect for the entire family to enjoy.